The King’s Storehouse Food Bank is a nondenominational Christian organization which distributes food from a central location to nonprofit organizations who feed the needy of East Texas and surrounding areas. The King’s Storehouse helps feed the hungry with the purpose of showing God’s love through His Son, Jesus Christ. 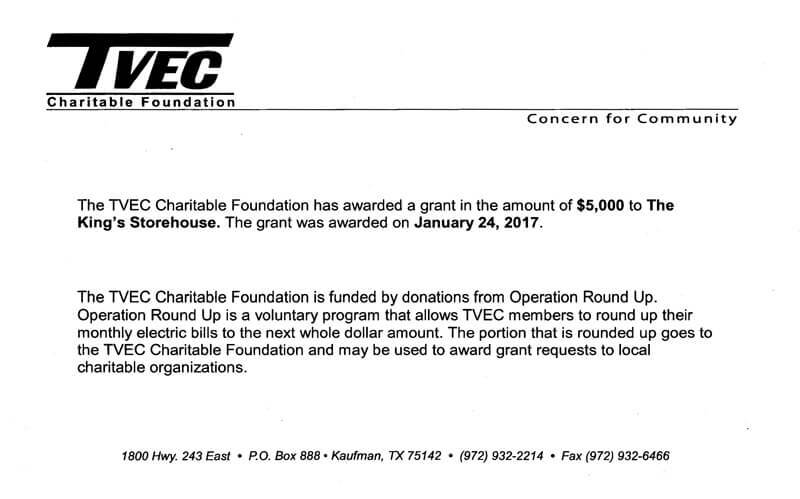 We sincerely appreciate receiving this grant from TVEC Charitable Foundation. These funds will help us to fulfill our mission of feeding the hungry of East Texas. To say… I love Thee best! Jan Mathew, a volunteer at The King’s Storehouse, went home to be with The Lord on February 2, 2017. She faithfully volunteered every Monday for about 12 years. She was a very generous person and always tried to help others. She was a poet and an artist. Jan loved The Lord and below is one of her poems that expresses this love. Her smiling face will be greatly missed. How many CEO’s does it take to run a food bank? How many outreach and development employees does it take to locate and procure millions of pounds in 30 years? How many paid writers does it take to receive over $200,000 in grants in 30 years? How many employees does it take to assure our ministries that we are in compliance with government regulations? The large food bank networks receive food through government/commodities programs and require compliance to those regulations to receive food. How many food bank networks do we participate in? How many marketers and publicity employees did it take to create these posters, brochures, etc., and make this happen? How many people does it take to move over 200,000 lbs. of food each year? How many prayers and gifts from God have been answered and given over the years?